This website is hosted by Tim Stowell. When submitting a query, information , etc., please enter "Chisago County" somewhere in your request. Since I host other counties I will not know which county your are referring to if you don't. Thank you! I don't live in Chisago County so I can't give you specific information related to Chisago County. I will be happy to advise you where to look, if possible. I recommend you first visit the Links & Other References page as you may be able to find help there. Thank you! Check out these Links & Other References for Chisago County. Check out the "ticker" on Links & Other References. Valuable genealogy tools and information. Share information with the Lookups page. Index of Surnames, Queries, and Researchers for Chisago County. Read Letters from Home. Share family stories of pioneer life in the area. Also check out the MNGenWeb Archives and USGenWeb Archives. 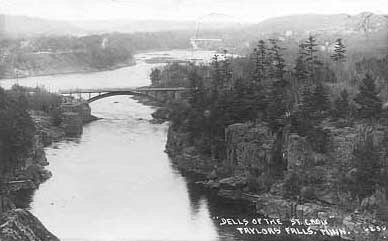 Penny postcard of Taylors Falls, MN, back of postcard is dated 1924.